In Rwanda, youth with disabilities are overcoming obstacles to employment. “I started to see my inner potential—that I could have a better life," says Christian Bayisenge. Christian Bayisenge knows that there will always be a market for well-made shoes. So while he is currently just an apprentice at a small shoemaking workshop in Rwanda, Bayisenge is slowly saving the money he needs to strike out on his own. Only a few years ago, Bayisenge could not have imagined this potential career path. Partially paralyzed since the age of 13, Bayisenge eventually dropped out of school and was unable to find work because of the significant discrimination facing young Rwandans with disabilities. He was unsure about what the future would bring. Things started to change for Bayisenge when he enrolled in EDC’s USAID-funded Huguka Dukore program. As part of its mission to promote social inclusion, Huguka Dukore actively identifies and recruits youth with disabilities to participate in its workforce development trainings and then provides them with links to the formal economy. Through Huguka Dukore classes, Bayisenge learned the technical skills he needed to apprentice as a shoemaker. He also gained the financial knowledge to manage his money, and now he’s participating in a local savings and investment club. And he says that being in class with peers from all different backgrounds restored his confidence that he could be a productive member of society. Changing attitudes about what youth with disabilities can or cannot do is a vital part of the effort, says EDC’s Tim Haskell. Daniel Ndayisaba is the master shoemaker at the shop where Bayisenge now works. Pacifique Iradukunda and Jean Paul Turishimye, two other apprentices from Huguka Dukore, also work there. Ndayisaba admits to feeling apprehensive when he first learned that three of his new apprentices had physical disabilities. But his attitude changed when he saw that all three apprentices were well trained. 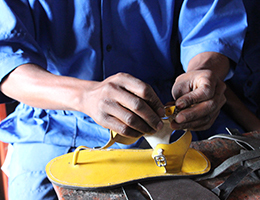 In Huguka Dukore, they had learned basic shoemaking techniques as well as the workplace skills that would allow them to be successful apprentices. Seeing the value that each of them offered to his business, Ndayisaba was no longer concerned about the specific things that his new apprentices could or could not do.